I meant to post this recipe a long time ago, (really! I did, promise!) but somehow time got away from me. I made them as a contribution to my sister’s Memorial Day bbq (so many weeks ago, I know!) and they came out great. I’ve made french fries before, but fried sweet potatoes are completely different and without the right steps, the results aren’t the best. Luckily with this recipe I’ve developed, I think it’s basically fool proof and I they came out pretty great! My sister bought the firmer white variety, but you can buy the softer orange center ones (sometimes labeled as yams) as well, whatever you prefer. What some people don’t realize, is sweet potatoes have a higher water content than regular potatoes. It’s harder to get them crispy because of this (but not impossible), after researching different methods, I came up with this recipe for a great crispy crunch as well as a spicy caramelized flavor. 1. 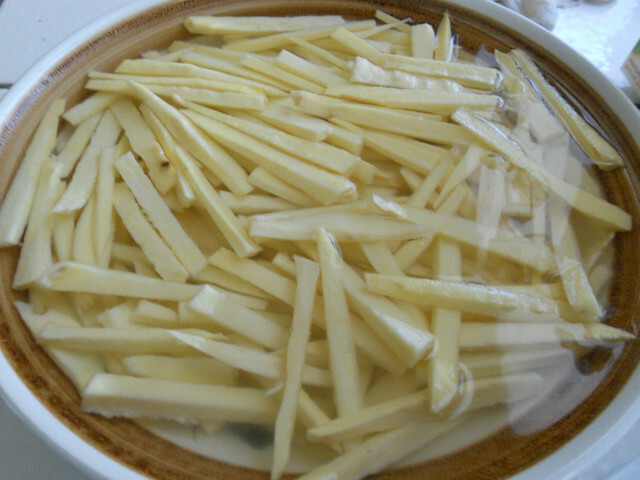 Cut potatoes into thin sticks, soak in a bowl of water as you finish cutting the rest. 4. Preheat oil to 375 degrees, whatever size pot you use, please remember to leave at least 3 inches from the surface of the oil to the lip of the pot. Sweet potatoes have a higher water content, so the bubbling up is more so than regular potatoes. Always take proper safety precautions when frying! 6. Add a handful (or 2 if you have a big pot of oil, but remember not to over crowd it) of your blanched sweet potato sticks to your egg white mixture. Toss to coat and fry immediately. 7. 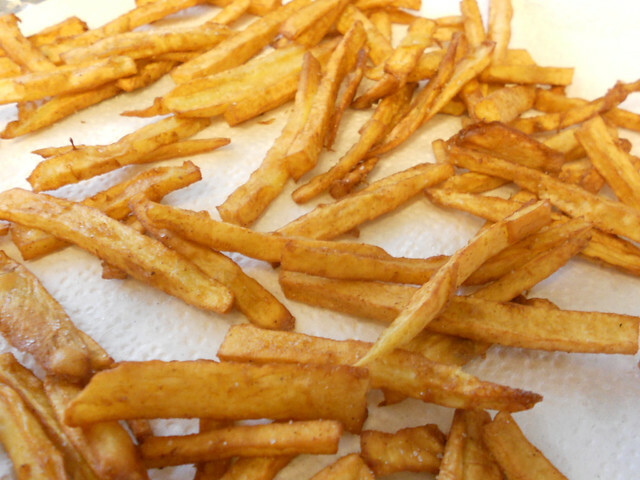 Give the potatoes a stir to prevent clumping together and fry for 4 mins or until golden brown. 8. Drain on paper towels, and add a sprinkling of salt immediately. 9. Indulge with an ice-cold beverage of your choice! 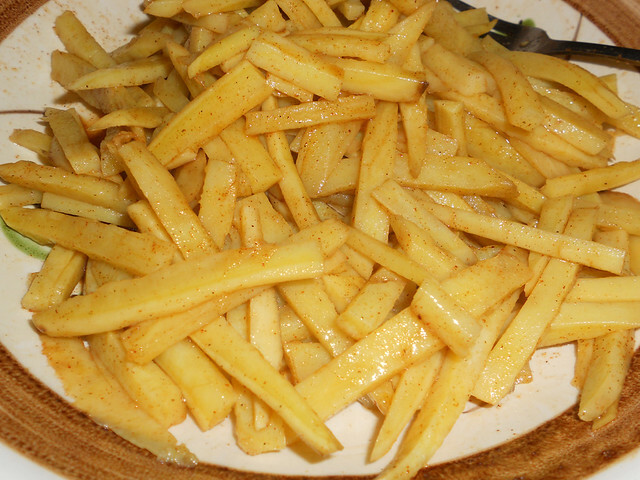 – Cutting the potatoes thinly helps with the crispness. Larger cut will result in a little less crisp, but the flavors are still great! – Don’t overdo it with the spices. It can over power the flavor of the potatoes and spices burn easily. 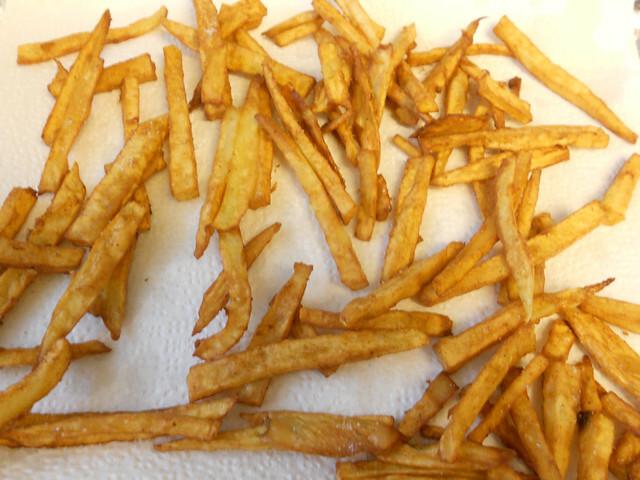 – After removing a batch of fries, let the oil come back up to temperature before adding another batch. My camera ran out of batteries so I never got a chance to take a picture of them all piled up beautifully on a dish. GAH! !